The goal of the school is to introduce Particle Physics and Astroparticle Physics to 3rd and 4th year physics students while at the same time touching on the latest results and challenges in these fields. For about a week, students will be immersed in an international research atmosphere, and will be able to spend time and discuss at length with scientists working in the field. There will be lectures on both the theoretical and the experimental sides of LHC Physics, Neutrinos, Flavour Physics and Astroparticle Physics (dark matter and cosmic rays), as well as a Computation Tools hands-on session and Question sessions. Courses will be in English. No background knowledge on the topics covered beyond a popular science level is assumed. A strong basis in Quantum Mechanics and a good knowledge of Special Relativity is expected, however. A maximum of 30 students will be admitted. Accomodation and lunches will be provided for free during the length of the school. The participant (or his/her university) is expected to assume the costs of travel and of 5 or 6 dinners. A few travel grants are nevertheless available. The school takes place at LAPP and LAPTh, world-class research laboratories just 40 km away from CERN. The laboratories are jointly hosted by the CNRS and the Université Savoie Mont Blanc. They are Enigmass Laboratories of Excellence and members of the International Doctorate Network in Particle Physics, Astrophysics and Cosmology (IDPASC). 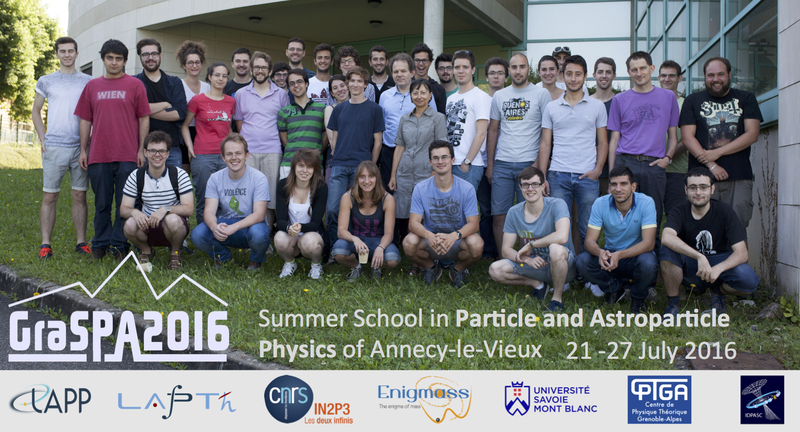 The LAPTh is also a partner of the Centre for Theoretical Physics of the Grenoble-Alpes region (CPTGA). Both LAPP and LAPTh are located in Annecy-le-Vieux, in the French Alps. The medieval city of Annecy is known in winter for its proximity to several ski resorts, and in summer for its beautiful lake.